Take advantage of your local farmers’ markets and farm stands in the fall and stock up on these locally grown crops for your winter food storage. 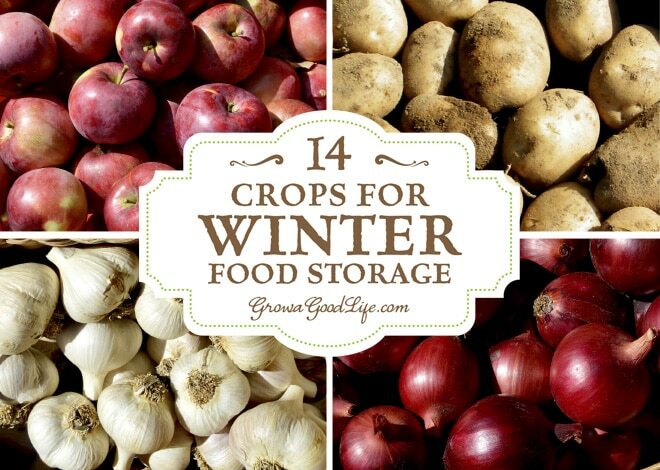 If you have an area in your basement, crawlspace, or garage that stays cool all winter long, you can make use of these cold spots to keep storage crops fresh well into winter. Although I grow and preserve much of the harvest by canning, dehydrating, and freezing, there are some crops that are perfect for winter food storage without any processing. A section of our basement is unheated and stays cool all winter long. This is where I stash most of our preserved garden bounty. Sturdy shelving holds our canned string beans, carrots, tomato sauce, applesauce, jellies, and other jarred goods preserved over the summer. Onions and garlic are hung in mesh bags from the ceiling. Late in fall when the temperatures cool, storage crops are added to the stash in various bins, baskets, crates, and boxes. A root cellar or cold room, such as an unheated basement or garage is a way to hold some foods for months after harvesting. Root cellaring is a way of storing fresh, raw, whole vegetables and fruits in a cool location with no processing. 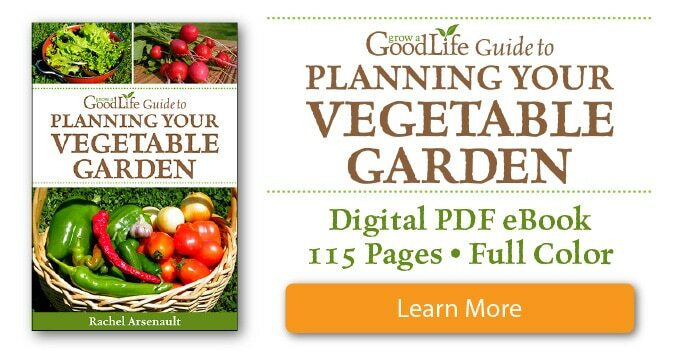 Vegetables that can be stored include many fall harvested root crops, pumpkins, and winter squash. Fruits ideal for storage include apples and pears known for their storage capabilities. Even if you don’t grow a garden, you can stock up on winter food storage crops at your local farmers’ markets during the fall. Some years, I don’t have enough gardening space to grow everything I want to grow. So I often rely on our local sources for some storage crops such as pumpkins and winter squash. Most of the farm stands in my area close for winter once the growing season is over. So there is some urgency to stock up on winter storage crops in October while they are abundant and available. Save Money: Crops grown or purchased in season at peak harvest are less expensive than those bought from the grocery store in winter. In addition, you won’t need electricity, canning supplies, or processing equipment to store keeper crops. Use Less Energy: Storing food doesn’t use extra electricity since you are not canning or relying on freezing to keep foods fresh. Since the food is grown locally, no shipping across the country to get to your grocery store. Food Security: You will have a winter’s supply of quantity and nutritious food to feed your family without having to run to the supermarket. 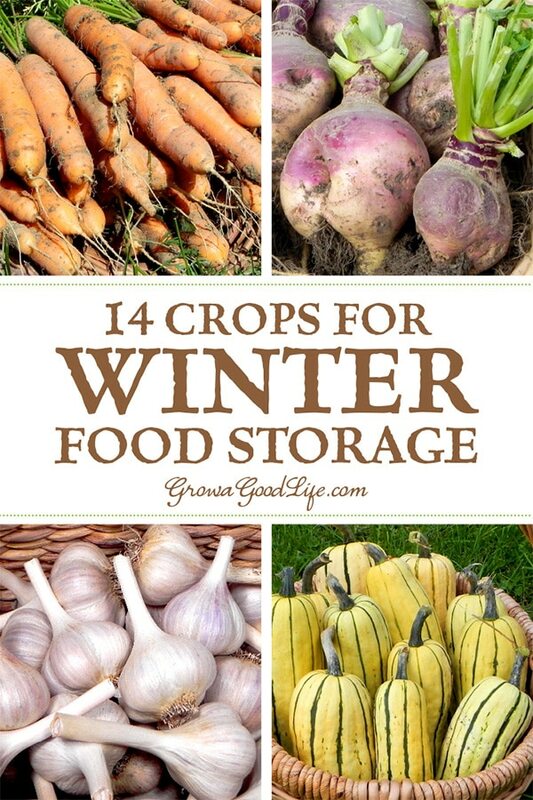 You don’t need a root cellar to keep storage crops in winter. A basement maintains a steady temperature and is usually cooler than the rest of the house. If you don’t have a basement, consider any location that stays above freezing through the fall and winter, such as your crawlspace, garage, mud room, bulkhead, under the back porch, or even a closet. Don’t worry if your circumstances are not perfect, as long as your storage area is relatively cool and stays above freezing, you probably still can store your vegetables and fruits for a period of time. It is worth exploring to test it out to see which crops will work and how long they last in your unique storage conditions. Beets: Trim tops and tap root to 1-inch. Brush off loose soil, but do not wash. Store beets in buckets, boxes or totes packed with damp sand or sawdust. Ideal storage condition for beets is at a temperature of 32-35˚F and 90% relative humidity. Check sand or sawdust frequently and re-moisten as needed to keep it damp. Beets can last up to 5 months in storage. Carrots: Trim tops, brush off excess soil, and sort by size. Larger carrots last longer in storage. Layer the carrots in damp sand or sawdust in a box or tote beginning with the largest ones on the bottom so you can use up the smaller ones first. Cover each layer of carrots with about 1/4-inch of sand or sawdust and add a final layer of 2-inches on top. Ideal storage conditions are at a temperature of 32-35˚F and 90% humidity. Under these conditions, carrots can last 4 to 6 months. Celeriac: Trim tops and gnarly roots to 1-inch. Shake off loose soil, but do not wash. Store celeriac in buckets or totes packed with damp sand or sawdust. Ideal storage condition is at a temperature of 32-35˚F and 90% relative humidity. They shrivel easily, so check sand frequently and re-moisten if needed. Under these conditions, celeriac usually last 2 to 4 months in storage. Parsnips: Trim foliage, brush off excess soil, and sort by size. Layer the parsnips in sand or sawdust in a box or tote beginning with the largest ones on the bottom so you can use up the smaller ones first. Ideal storage condition is at a temperature of 32-35˚F and 90% humidity. Under these conditions, parsnips can last 3 to 5 months in storage. Rutabagas: Trim tops and tap root to 1-inch. Brush off loose soil, but do not wash. Store rutabagas in buckets or totes packed with damp sand or sawdust. Stores best at a temperature of 32-35˚F and 90% humidity. Rutabagas dry out easily, so check sand frequently and re-moisten if needed. Under these conditions, rutabagas usually last 2 to 4 months in storage. Turnips: Trim turnip tops to 1-inch and brush off excess soil. Store turnips in boxes or totes packed with damp sand or sawdust. Ideal storage condition for turnips is at a temperature of 32-35˚F and 90% relative humidity. Check sand or sawdust frequently and re-moisten as needed to keep it damp. Can last 3 to 5 months in storage. Winter Radishes: Trim off the tops and layer in moist sand or sawdust in buckets or totes. Ideal storage condition is at a temperature of 32-35˚F and 90 relative humidity. Can last up to 2 to 4 months in storage. Apples and Pears: Choose apple and pear varieties that are known for their storage capabilities. Apples and pears that store well are usually firmer and have thicker skins. Air circulation is important for long-term storage. Package the fruit so it can breathe, and they do not touch. Wrap each apple individually in a sheet of newspaper or nestle them in shredded paper and store in well-ventilated boxes or crates. Both apples and pears release ethylene gas that can increase the ripening process of some vegetables. If you can, try to locate fruit away from other storage crops. Ideal storage condition for apples and pears is at a temperature of 32-40˚F and 80-90% relative humidity. Can last up to 2-6 months depending on the variety. Sort through frequently and remove any soft or rotten fruit. Cabbage: Keep roots attached and wrap in newspaper and store in crates, or sit roots in a bucket of moist sand. Warning: The odor of cabbage will be noticeable and may even be absorbed by other crops stored nearby. Try to store cabbages separate from living areas and other crops. Ideal storage condition for cabbages is at a temperature of 32-40˚F and 80-90% relative humidity. Can last up to 3-4 months. 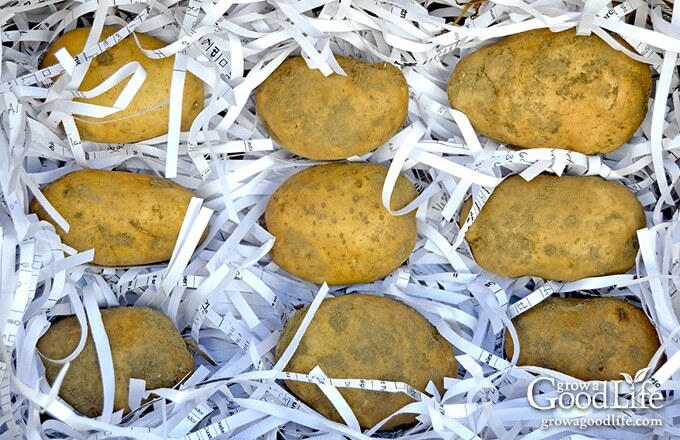 Potatoes: Different potato varieties last longer in storage than others. If you are purchasing from a farmers’ market, ask the growers which varieties they recommend for long term storing. Cure unwashed potatoes before storing so the skins heal over and thicken up. 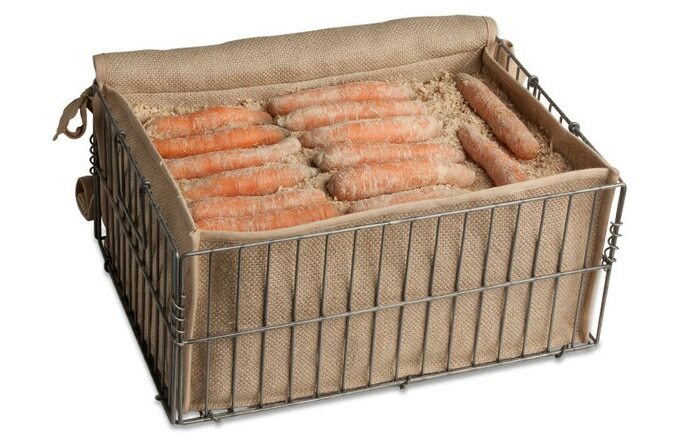 Store cured tubers in a dark area in covered boxes or bins with some holes for ventilation. Ideal storage conditions for potatoes are at 32-40˚F and 80-90% relative humidity. Can last 4-9 months depending on the variety. -> See 5 Steps to Storing Potatoes for Winter for more detailed information on how to prepare your potatoes for long-term storing. Garlic: Garlic need to be cured before long-term storage. Curing allows the layers to dry out forming a protective cover around the bulb. Most garlic purchased at farmers’ markets in the fall has already been cured. Store cured garlic loosely in baskets or hang in mesh bags in a cool, dark, and dry location. Sort through the garlic every now and then and pull out any bulbs that feel soft or have sprouted. Different garlic varieties have different storage lives. Ideal storage conditions for garlic are at a temperature of 32-50˚F in a dry area with a relative humidity of 50-60%. Garlic can last up to 6 months in storage. -> See Harvesting, Curing and Storing Garlic for more detail on how to cure your garlic before storing. Onions: Select onion varieties with long-term winter storage capabilities. Onions need to be cured and dry before storing. Cure the onions by spreading them out in a single layer in a dark, cool, and dry location with good airflow. Once cured, trim tops to 1-inch and store loosely in baskets or mesh bags in a cool, dark, and dry location for winter. Check the onions every few weeks and remove any that develop soft areas. 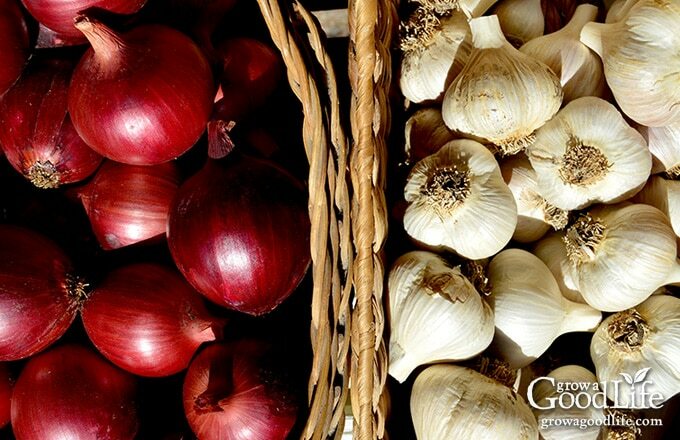 Store onions at a temperature of 32-50˚F in a dry area with a relative humidity of 50-60%. Different varieties and storage conditions will affect how long they last. Some varieties of onions can last up to 6 months in storage. Pumpkin: Choose fully ripe pumpkins with at least 1-inch of stem for storing. The stem helps prevent the pumpkin from rotting. Do not carry the pumpkin by the stem because it can break off reducing the storage quality. Pumpkins are usually cured in the field before harvesting. If harvested fresh, cure at 80-85˚F for about 10 days. Curing allows the skins to thicken and form a protective barrier. Store cured pumpkins in an area that is dry, cool, and receives good air circulation. Ideal storage condition for pumpkins is at a temperature of 50-55°F and 50-70% humidity. Most pumpkins will keep for several months in storage. 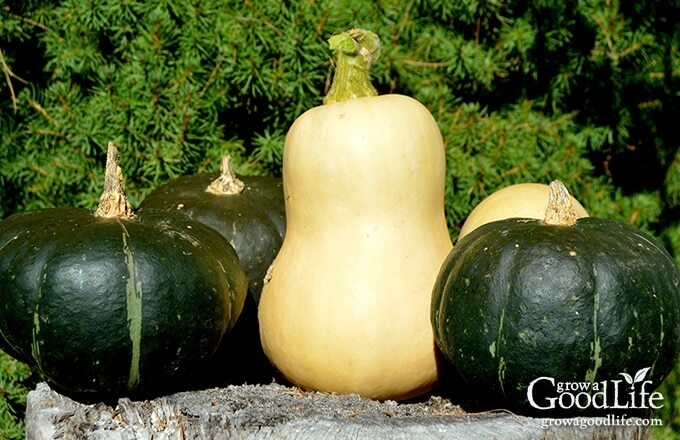 Winter Squash: Choose mature winter squash with at least 1-inch of stem for storing. Cure at 80-85˚F for about 10 days before storing to allow the rinds to thicken. Store cured winter squash in an area that is dry, cool, and well ventilated. Ideal storage conditions for winter squash is at a temperature of 50-55°F and 50-70% humidity. Most winter squashes will keep for several months in storage. Some varieties, such as Butternut and Blue Hubbard can last up to 6 months. Start small and experiment on a small scale to see how crops store in your home. Try a few items here and there and check on them frequently for signs of spoilage. Keep notes. Grow or purchase varieties that are good for storing. Some varieties are better for long-term storage than others. Only store mature, unblemished crops with no nicks, cuts, or bruises. Handle with care to avoid damage. Use a digital thermometer to monitor different areas of your home. Check on your stored food weekly. Monitor the condition of the stored crops and use up any that start to soften or sprout. Remove any foods that show signs of deterioration or decay. Keep a clipboard with a running inventory near your stash. Don’t hoard the food. Eat it. It will feel nice to have a room full of stored fruits and vegetables. You may be tempted to try to stretch out the supply as long as you can. The trouble is, most storage situations are not failsafe. Unpredictable situations can cause your food to deteriorate. Enjoy it while it is fresh. Store fruits and vegetables in separate areas. 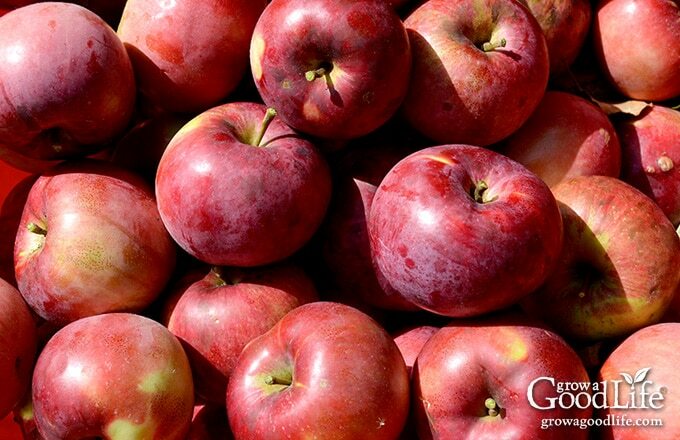 Apples release ethylene gas that can increase the ripening process of some vegetables. Be ready to deal with unexpected conditions. What will you do with 50 pounds of potatoes that sprout prematurely due to a warmer than normal winter? What if your onions are getting soft? Have a plan of action in case you need to use up your stores, so they don’t spoil. I hope this article gives you some creative ideas and helps you discover areas in your home that are ideal for winter food storage. Storing foods in a root cellar or cool area is a good way to eat locally grown produce, save money at the grocery store, and become more self-sufficient. Bubel, Mike and Nancy. Root Cellaring: Natural Cold Storage of Fruits and Vegetables. Storey Publishing. Storage Guidelines for Fruit and Vegetables. – Cornell Cooperative Extension. 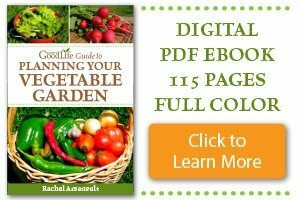 Root Cellars 101- Root Cellar Design, Use and Mistakes to Avoid – Common Sense Homesteading. Wow! Great tips! I was looking for carrot storage tips and this answered that question and so many more. 🙂 Thanks for all the great info! You are welcome, Jean. It takes time to figure out how much we use and what I need to grow in order to last us through winter. It is so nice to be able to rely on other local farmers to fill in the gaps. What a great list – I really liked how you itemized the storage based on temp and humidity. A very handy guide to have on hand, Rachel…thanks!